AHSAHKA, Idaho -- A northern Idaho hatchery that produces millions of steelhead and spring chinook salmon is wearing out and needs extensive repairs that could cost tens of millions of dollars, an official said. Dworshak National Fish Hatchery Manager Larry Peltz said he's putting together a rescue plan for the 40-year-old facility that produces fish central to recreational and tribal fisheries from the mouth of the Columbia River to the South Fork of the Clearwater River. "We have to figure out what to do to resolve all of this because these fish are important," Peltz told The Lewiston Tribune. "Economically these fish make a huge difference to this region. I don't think there is anyone who is going to argue with that." 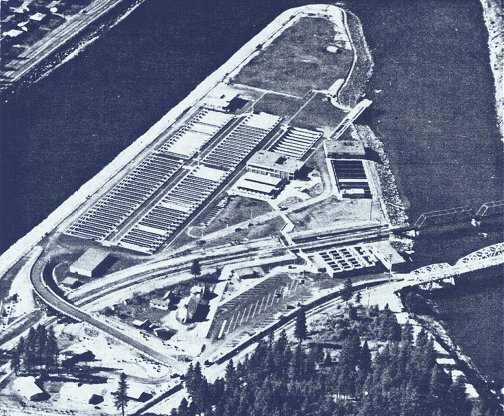 The hatchery was built in the late 1960s to mitigate the steelhead run that was eliminated from the North Fork of the Clearwater River with the construction of Dworshak Dam. In the 1980s it began to produce spring chinook to mitigate for salmon killed at the lower Snake River dams. Peltz said problems at the hatchery include antiquated fish-rearing technology, concrete rearing ponds that are eroding, and valves that are stuck open. He also said the design of the hatchery makes it expensive to operate, using $2 million worth of energy from Dworshak Dam. The hatchery doesn't pay for the energy, but Peltz said if the hatchery were made more efficient that energy could be sold to customers. He said keeping the hatchery operating is labor intensive and, ultimately, a losing battle. "We can keep doing that and keep using duct tape and baling wire to keep this thing together and make fish," he said. "I'm not sure how long we can do that. The other option is to shut down and build a new facility that will last another 40 to 50 years, or we can try to do something in between." Pelts recently met with the Bonneville Power Administration, U.S. Fish and Wildlife Service, Nez Perce Tribe, Idaho Department of Fish and Game, and the U.S. Army Corps of Engineers to discuss the problems. Scott Marshall, administrator of the U.S. Fish and Wildlife Service's Lower Snake River Compensation Plan hatcheries at Boise, said there is a responsibility to produce runs of steelhead and salmon to mitigate losses to dams. "It goes to the core of the values that Congress set forth when it said 'when we build federal water development projects, we will mitigate for those projects and preserve fish and fishing because it is vital to the social, cultural and economic benefits of this region,'" he said.